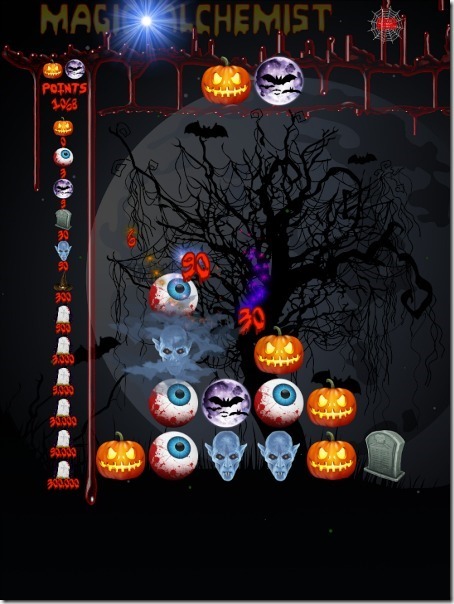 Looking for some fun Halloween apps for your mobile device? Here are a few I found for both Android and iOS, kids and adults that are sure to keep you entertained till Halloween gets here! 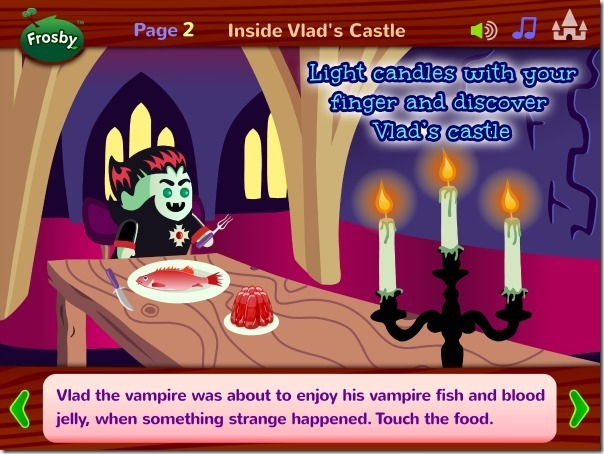 Explore Vlad’s castle and touch different parts of it to do different things. This is your chance to explore a vampire’s castle! The image below makes me want to see what will happen when you click on the food! 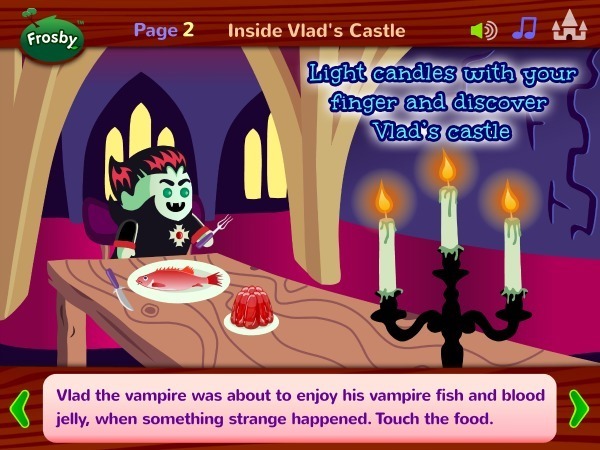 Vlad’s Vampire Bats is FREE and for iOS only. 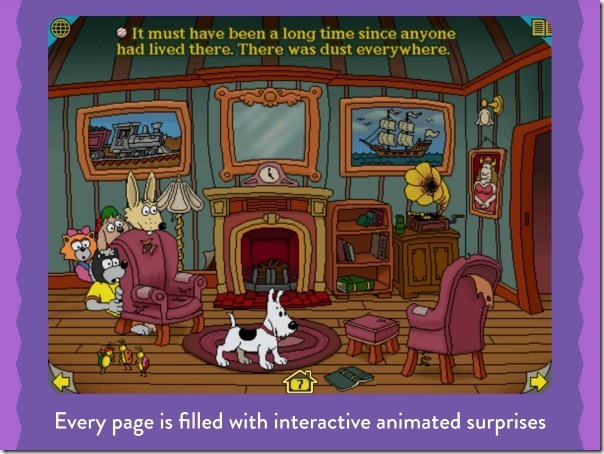 This is an interactive story for kids. Flip the pages and click to interact while you read. Harry and the Haunted House is for iOS only. Play doctor to the wicked! Treat the injuries and make the monsters all better. Might be a little scary for some sensitive kids. 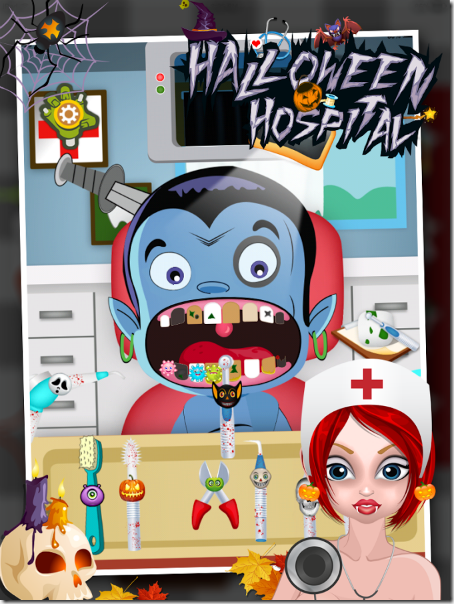 Halloween Hospital is available for FREE on Android. The Halloween version of Jewel Mania. Match jewels to advance in the game. There are special Halloween gems in this version! 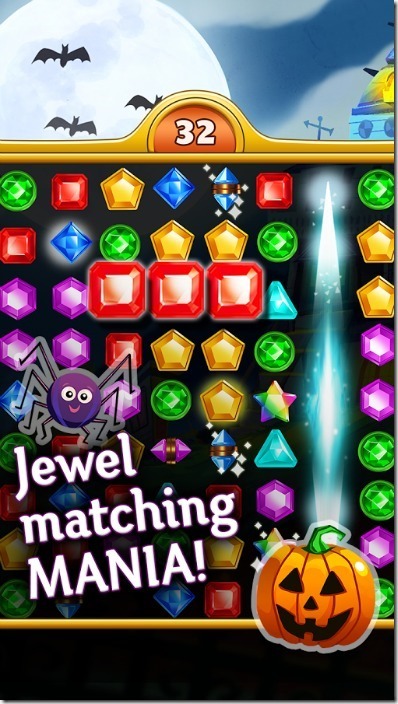 Jewel Mania Halloween is FREE on Android or iOS. Just like traditional suduko puzzles but with a Halloween theme. 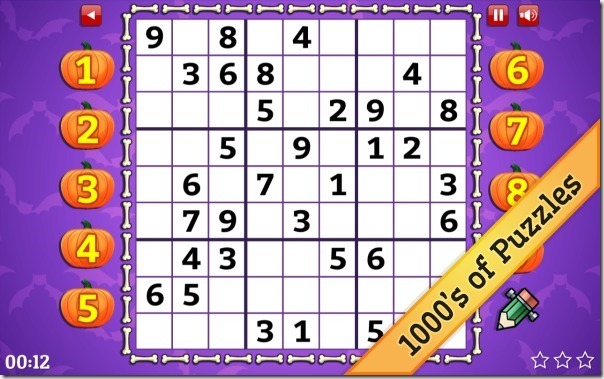 Includes thousands of puzzles with four different difficulties. Halloween Suduko is FREE on Android. The Halloween version of Magical Alchemist is here. Merge different combinations of magical ingredients until you discover the final and most mysterious Halloween object. Listen to spooky Halloween music while you play. Magical Alchemist Halloween is FREE on Android. 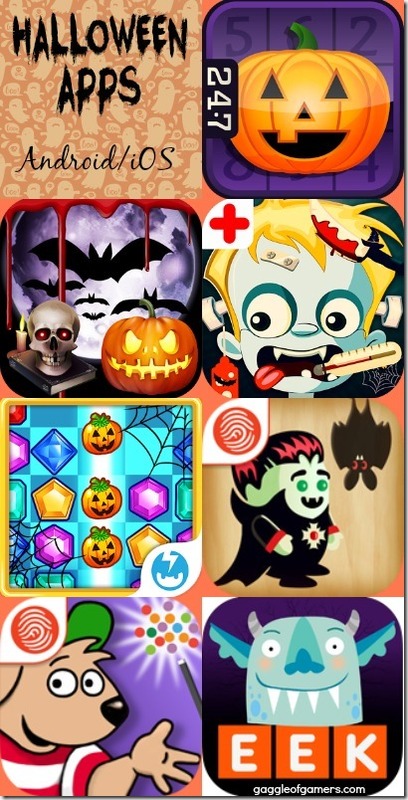 You can get Magical Alchemist Halloween Lite for FREE on iOS or $2.99 for the full version. There are many more out there, just do a search on your respective mobile store! Remember if you are downloading for a minor, to pay special attention to the features of the game such as whether there is paid downloadable content or whether it allows your child to play with others online. If you have any specific suggestions, I’d love to hear it. You’re welcome! I hope you find one you like. 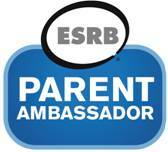 Great apps to share with the kids, I am sure they will enjoy them. Halloween Hospital would totally freak me out LOL but the Jewel Mania Halloween sounds like fun! I was thinking the same thing. It suggests ages 2-6 but I put 4-7. Even my 7 year old would be freaked out by some of it. My kids would love these, Thanks for sharing. Never thought about looking for some Halloween Apps, a few of these sound good so I will have to go check them out even though Halloween is over, they will still be fun. Thanks! Thank you for your review of the above aps. 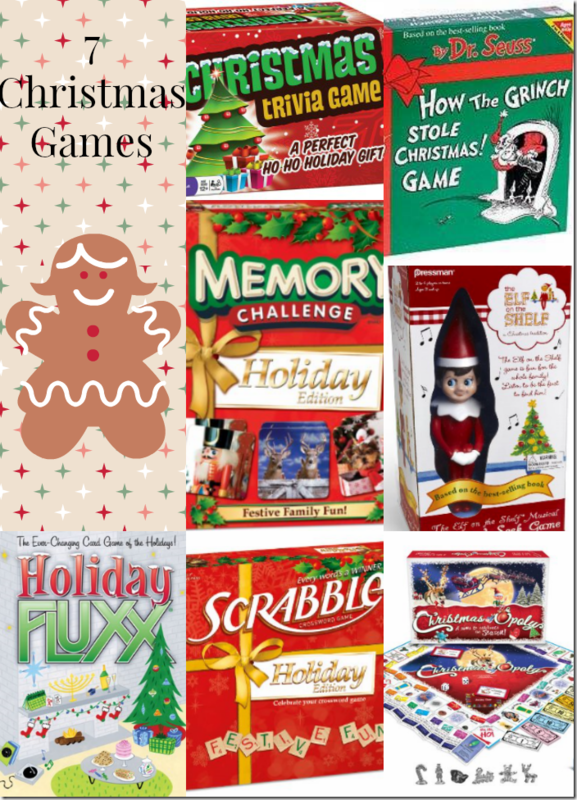 Your post shows a variety of interesting and entertaining games for most ages. Thanks for this information.